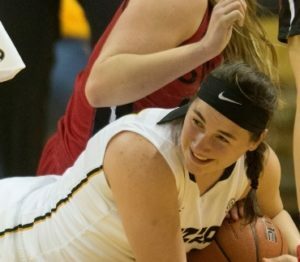 Mizzou Women’s Basketball topped SIU-Edwardsville, 72-60, on Wednesday night to kick-off a four-game homestand. Mizzou (7-3) capitalized on a strong second half and a dominant presence from the free throw line to down SIUE (2-6). The Tigers made at least 20 free throws for the fourth time this season. Senior guard Sierra Michaelis (Mercer, Mo.) led the Mizzou offense, setting a new career high for 3-pointers in a game with six treys. She moved up to sixth place in program history for career 3-point field goals made with 136 three’s. She posted a season-high 24 points to lead all scorers on Wednesday. Sophomore Cierra Porter (Columbia, Mo.) tallied 18 points and 13 rebounds for her fifth career double-double. She has recorded at least 10 points in 10 consecutive games to begin the season. Michaelis and Porter combined for a total of 42 points, the most by any Mizzou duo this season. Mizzou continues its homestand on Friday when the Tigers host Wichita State. Tip is set for 7 p.m.